This marks the 100th post on TheBurgerReview. 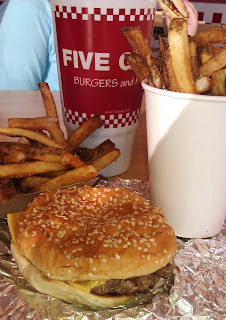 After a ton of burgers, a review of Five Guys Burgers and Fries was conspicuous in its absence. I will say that I was not a fan of their decor, which consisted solely of great reviews. That would be like me wearing a shirt advertising that I am a great kisser and an amazing lover. Show..don't tell. The Beef: The patty was fresh beef...80:20--not a trace of aging. The beef was relatively mild in terms of hearty beef flavor, but it was juicy. Each patty was 3.2 ounces of fresh, never-frozen Chuck. The Sear: A fine sear was accomplished via a very hot griddle. The Preparation: The burgers at Five Guys were cooked on a griddle to a juicy Well Done. The patties were smashed flat and seared perfectly. What really put the burger over in terms of texture was the fact that they wrapped it in foil the second that it was assembled. This allowed the ingredients to get steamy, and this caused everything to bind together in a wonderful way. If you prefer your cheeseburgers with bacon, then you should request that the cheese be melted over the bacon. Otherwise, they will stack the burger on top of the bacon, and this does not make sense. You want the bacon on top for crunch, and you want the cheese to hold it in place. The Cheese: American--super gooey American. The Bun: The Standard seeded bun was Sarah Lee that one could have purchased in any grocery store. It was soft, toasted, sweet, and compressed perfectly. The Meat To Bun Ratio: For the Little Cheeseburger, the ratio was dead on. 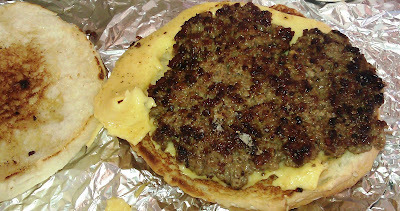 In the case of a regular Cheeseburger (double meat), there is a little too much meat and heft for the soft bun. 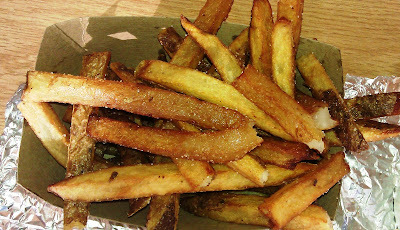 The Fries: These were peel on and the farm of origin, or at least the city of origin, has always been listed on the whiteboard. The fries were par-cooked, generously seasoned, and dark. If you like your fries crispy, be sure to specify that--sometimes the fries can be a little lank. A regular sized order ($2.99) was enough for 3 adults. Toppings: The following list accounts for the toppings for which there is no additional charge. Bacon is extra. The Value: A 3.2 ounce cheeseburger was about 4 bucks. It was a damn good value. The larger cheeseburger (double) was an equally good value. Free refills on drinks, free peanuts, and a huge amount of fries made this an excellent deal. In spite of the seemingly average ingredients, the Five Guys cheeseburger transcended its humble, component parts to achieve a glorious whole. This was a symphony of textures. Chewy bun--crumbly beef--gooey cheese. It was a gift to my mouth. The saltiness of the cheese was a perfect compliment to the near blandness of the patties. While there were condiments in abundance, none were needed. Burger Review : Totally deserving of Zagat's Best Fast Food Burger for 2010 If you haven't tried one, do so. Do so soon. Rating...4 Bites To be fair, some days the beef can tend to be bland, and that only warrants a 3 Bites rating on those occasions. 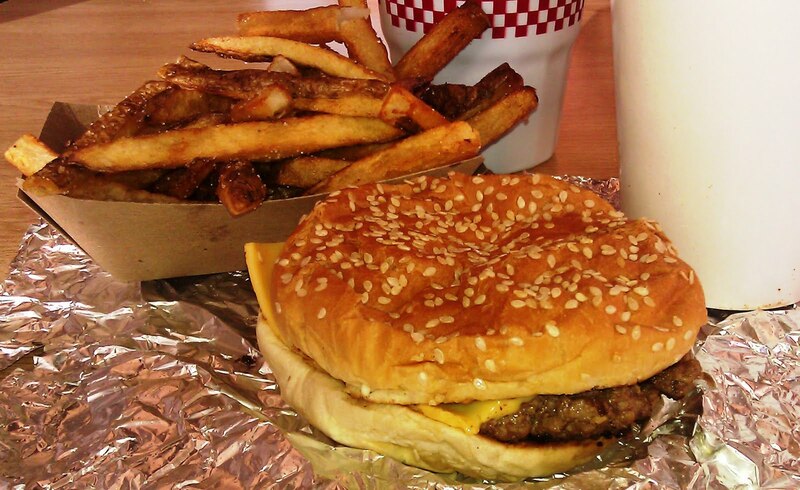 Zagats, Consumer Reports, and The BurgerBusters stand by Five Guys Burgers and Fries as a top fast-food burger. We sampled it on the day the review was posted. Also, horse meat is damn delicious--flavorful and lean. I like it raw (Basashi), but some Russian delis carry it as a sausage, and it is good. Thanks for reading, and thanks for participating. Question, do you know if they put butter on the buns? I don't believe that Five Guys butters the buns.